Objectives This study is an analysis of the contribution of pre-existing medical conditions to unintentional fatal child (0–14 years) drowning and a of critique prevention stratagems, with an exploration of issues of equity in recreation. Design This study is a total population, cross-sectional audit of all demographic, forensic and on-site situational details surrounding unintentional fatal drowning of children 0–14 years in Australia for the period of 1 July 2002 to 30 June 2012. Data were sourced from the National (Australia) Coronial Information System. Age-specific disease patterns in the general population were obtained from the Australian Institute of Health and Welfare. Results Four hundred and sixty-eight children drowned during the study period. Fifty-three (11.3%) had a pre-existing medical condition, of whom 19 suffered from epilepsy, 13 from autism and 5 with non-specific intellectual disabilities. Epilepsy is a risk factor in childhood drowning deaths, with a prevalence of 4.1% of drowning fatalities, compared with 0.7%–1.7% among the general 0–14 years population (relative risk: 2.4–5.8). Epilepsy was deemed to be contributory in 16 of 19 cases (84.2% of epilepsy cases) with a median age of 8 years. Asthma and intellectual disabilities were under-represented in the drowning cohort. Conclusion Except for epilepsy, this research has indicated that the risks of drowning while undertaking aquatic activities are not increased in children with pre-existing medical conditions. Children with pre-existing medical conditions can enjoy aquatic activities when appropriately supervised. Children are the age group most at risk of unintentional fatal drowning. Medical conditions such as epilepsy are believed to increase drowning risk. Epilepsy increases the relative risk (2.4–5.8) of drowning in childhood, with a prevalence of 4.1% of drowning deaths, compared with 0.7%–1.7% among the general population. No other identified pre-existing medical conditions were associated with an increased risk of drowning. Heightened supervision of children around water is always warranted, including those with pre-existing medical conditions. A higher level of supervision is required for those with epilepsy. In this paper, we report such an audit comprising a 10-year (2002–2012) national population study of every unintentional childhood drowning fatality occurring in Australia. In this study, we have linked each drowning with both a forensic review and an analysis of each child’s medical history. explore issues of equality of aquatic recreation. This total population study analysed the details of every child (0–14 years) who died from unintentional drowning in Australia between 1 July 2002 and 30 June 2012. Under each state’s and territory’s legislation, drowning fatalities in Australia must be notified to the coroner by the doctor certifying death. In Australia, a nationwide coronial database is a confidential register of all deaths deemed unexpected or unnatural by the certifying doctor.26 This is a total population audit of child unintentional fatal drowning in Australia using the National (Australia) Coronial Information System (NCIS) as the primary dataset. From this, RLSSA has generated a National Fatal Drowning Database. This complete, total population database is the gold standard of unintentional drowning deaths in Australia. Cases in the database are routinely cross-referenced against the NCIS and updated as cases become closed (ie, are no longer under investigation by a coroner). Data in this study are correct as at 7 December 2016. All cases of aquatic death THAT were not due to drowning (eg, shark or crocodile attack, boating injuries due to physical trauma, and so on) were excluded. Cases identified as self-inflicted harm, homicide, infanticide or the result of assaults were also excluded. Cases were included: even when no body was recovered or where only skeletal remains were found, and cases that did not have a coronial ruling at the time of analysis but where the interim cause of death was stated as drowning. At the time of analysis, 97.2% of child drowning cases used within this study were closed within the NCIS system. Perusal of the still-open cases (2.8%) suggests these are in no way atypical of the overall database. One of the authors (JP) reviewed the medical details of each case. Details of every drowning scenario, rescue, resuscitation and pre-existing medical condition were reviewed. We defined a pre-existing medical condition as one recorded in the medical history of the victim, obtained from: (A) initial police reports of the fatality; (B) from the report of the attending forensic pathologist undertaking the coronial autopsy; and (C) details from transcripts or findings of subsequent coronial inquests. For children with two or more pre-existing medical conditions (5.7%), only the leading condition was coded and used for analysis. For every case, two of the authors (JP and RF) together formed a collaborative interpretative judgement concerning whether the pre-existing medical condition: (A) was the direct cause of death due to drowning (eg, an epileptic seizure in the water); or (B) compromised (with fatal conclusion) any aspect of an otherwise effective rescue or successful resuscitation; or (C) was incidental to the circumstances of the drowning incident or its fatal outcome. This study was approved by the Department of Justice and Regulation Human Research Ethics Committee (JHREC) (CF/07/13729; CF/10/25057, CF/13/19798). There were 2896 unintentional drowning deaths in Australia between 1 July 2002 and 30 June 2012. Of these, 468 (16.2%) were children (0–14 years) and 53 (11.3% of all fatal child drownings) had an identified pre-existing medical condition, with an average of 5.3 deaths per annum (figure 1). Males accounted for 64.7% of all childhood drowning fatalities; however, males and females were equality represented within the cohort with pre-existing medical conditions (m: 11.6%; f: 10.9%). Nineteen victims (35.8%) were aged 0–4 years, 20 (37.7%) were aged 5–9 years and 14 (26.4%) were aged 10–14 years (table 1). Child (0-14 years) drowning deaths and status of pre-existing medical conditions, by financial year. Total population survey, Australia, 2002/03–2011/12 (N=468). Fifty-three children suffered from a pre-existing medical condition (table 2). Children with pre-existing medical conditions were on average older (7.0 years) than those children without pre-existing medical conditions (3.7 years). Children with pre-existing medical conditions drown in similar circumstances to those without. Children with pre-existing medical conditions commonly drowned in swimming pools (32.1%), bathtubs and rivers (18.9% respectively), as a result of falls into water (49.1%) and while swimming (22.6%) and bathing (20.8%). Location of drowning and activity prior to drowning were not found to be statistically significant for children with pre-existing medical conditions. Alcohol was found to be present in 3.8%, though it was not found to be statistically significant. Four victims were known to be Aboriginal and/or Torres Strait Islander. Almost half (43.4%) of drowning deaths occurred in areas classified as major cities, with a further 7.5% taking place in remote and very remote locations. The majority of victims (86.8%) were not visitors. Children with epilepsy (35.8%) included those with primary diagnoses of a seizure disorder, Landau Kleffner Syndrome, persistent febrile convulsions and Lennon-Gastaut syndrome. Other medical conditions (11.4%) included diagnoses such as Down syndrome, cystic fibrosis, fetal alcohol syndrome and Duchenne muscular dystrophy. Epilepsy is an associated risk factor in childhood drowning deaths, with a prevalence of 4.1%, compared with a prevalence of 0.7%–1.7% among the general 0–14 years age population (RR: 2.4–5.8 (95% CI 1.3 to 13.7)). The median age of children who drowned with a diagnosis of pre-existing epilepsy was 8 years (range 2–14 years). Intellectual disabilities (RR: 0.2; 95% CI 0.1 to 0.6) and asthma (RR: 0.05–0.09; 95% CI 0.0 to 0.3) were associated with a lower risk of drowning than that in the general population. The analysis and interpretation of the links between pre-existing medical conditions and fatal drowning are shown in table 3. In 16 children (30.2% of the 53 children with an identified pre-existing medical condition), their pre-existing medical condition had no impact on the drowning event. For example, the fact that a toddler had cystic fibrosis was incidental to his wandering away from a family picnic and drowning in an ornamental pond nearby (table 3). One child had Down syndrome, and another was developmentally delayed (and suffered epilepsy), which we deemed contributory to the drowning. We deemed several pre-existing conditions other than epilepsy (eg, autism, intellectual disability, neuromuscular disease and myocarditis) possibly or directly contributory to the drowning in 20 cases. No child with cerebral palsy, uncomplicated by epilepsy or other condition drowned. Among the 16 victims where epilepsy was deemed to be a direct cause: 14 were born in Australia (the country of birth was unrecorded in two cases). Two children were identified as of Aboriginal and/or Torres Strait Islander descent. None were overseas visitors. Two-fifths (43.8%) were aged 10–14 years, with only one victim under 5 years of age. Five children were in a bathtub and bathing at the time (aged 3–14 years), five were in swimming pools, two were at the beach, two were in rivers, one was in a lake and one in a dam (table 4). None were appropriately supervised at the time. In this study, 11% of all childhood unintentional drowning victims had an identified pre-existing medical condition; this was lower than that which was found by Schyllander et al (16%).34 Similar to other studies, two-thirds (65%) of childhood drowning fatalities were male34 35; however, males and females are equally represented within the cohort with pre-existing conditions. Children with epilepsy commonly drowned in aquatic environments in and around the home, such as bathtubs (31%) and swimming pools (31%), and none were adequately supervised at the time of their drowning. 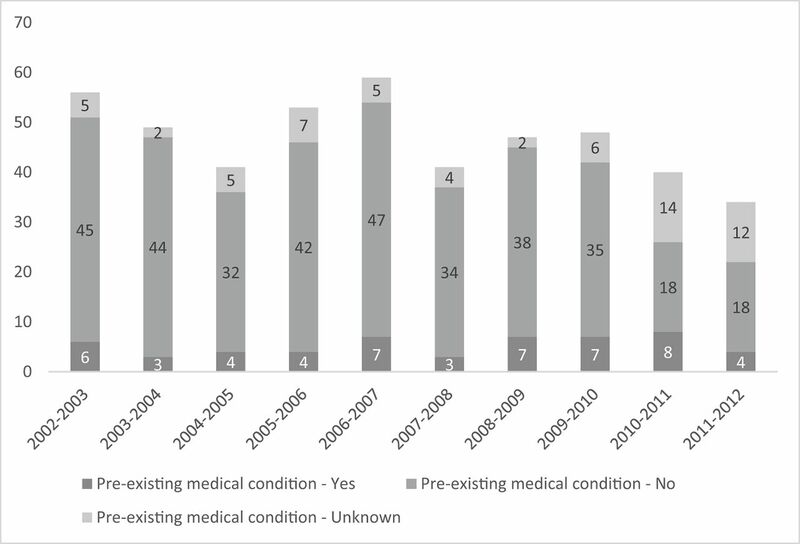 At the outset of this research, we posited that pre-existing medical conditions increase the risk of fatal drowning by one or more of three mechanisms: (A) the pre-existing condition (eg, autism)36 might increase the likelihood of a child inappropriately seeking and entering a water hazard; (B) the condition might increase the risk of drowning once the potential victim is in the water (eg, frailty or muscular paresis or paralysis); or (C) reduced rates of successful resuscitation or successful intensive care outcomes due to pre-existing medical conditions (eg, cystic fibrosis). In the context of current supervisory practices that relate to children with pre-existing medical conditions, this study has confirmed that there is no increased risk for children with delayed social and intellectual development. Rather, intellectual disabilities and asthma were associated with a lower risk of drowning than that in the general population. We posit that this association is related to decreased exposure to aquatic hazards and to instinctive heightened supervision of children.10 This applies particularly to frailty, due to sarcopenia particularly of neuromuscular diseases. We believe that this is one reason why this research has not revealed an increased risk to such children, apart from those with epilepsy. An assessment of the mathematical increase in risk necessitates the compilation of exposure denominators that are unknown and probably unknowable for this group of conditions. Children with a priori medical condition may not have had an equal opportunity for swimming lessons30 and as such might be at greater risk of drowning. The only pre-existing condition that leads to an increased risk of fatal drowning, under current real-life conditions of supervision, once a child is in the water, is epilepsy. Again, there is a relative increase but the absolute mathematical risk remains small and maybe zero with compensatory supervision.5 We posit that multiple, pre-existing medical conditions, specifically associated with epilepsy, may contribute to the risk of drowning, further work is required to elucidate this point. Advocacy for, and the implementation of, safety barriers (ie, barriers that prevent access) around water hazards (especially domestic pools and ponds), have dramatically reduced the rates of childhood drowning.8 9 38 Such safety barriers are particularly important in the prevention of drowning if children have pre-existing medical conditions especially frailty from any cause and those with intellectual disability. This study is the first longitudinal total population analysis of the prevalence and role of pre-existing medical conditions in unintentional fatal drowning among children aged 0–14 years using unselected, total population coronial data. The use of coronial data allows for a deeper understanding of the presence of pre-existing medical conditions as identified by forensic pathologists by accessing coronial autopsy reports. There were a small number (13.2% of all unintentional child fatal drownings) of cases where pre-existing medical condition was unknown. This was due to no information being available about the status of the pre-existing medical condition due to the autopsy document not being available, no mention being made of pre-existing medical conditions in the case documentation or that the parents did not want an autopsy to be undertaken. There were also six cases associated with a mass flooding and casualty event in the 2011/12 financial year where autopsies were not undertaken. This study examined fatal drownings only; it should be noted that it is not known if the non-epilepsy chronic medical condition related non-fatal drownings have higher rates of severe morbidity. Studies of this nature of necessity depend on the subjective assignment of causal roles leading to injury. We believe that the expertise of the two experienced reviewers (paediatrician and neurologist, and safety analysis expert) provide current best subjective review of such causality. There are nuances in the relationship between pre-existing chronic illness and the risk of childhood drowning. This study shows that the mathematical risks of aquatic activities are not dangerously increased in children with pre-existing medical conditions, when compared with the baseline population. Awareness of prevention strategies and the need to ensure heightened vigilance of children with pre-existing medical conditions, particularly those with epilepsy, is required. Children with pre-existing medical conditions should not be denied the joys and developmental experience of aquatic activities. This research is supported by the Royal Life Saving Society - Australia to aid in the reduction of drowning. Research at the Royal Life Saving Society - Australia is supported by the Australian Government.
. Reducing drowning deaths: the continued challenge of immersion fatalities in Australia. Med J Aust 2010;192:123–6.
. Bathtub immersion accidents involving children. Med J Aust 1977;1:211.
. Disability and drowning: personal Experiences, Research, and practicalities of adapted aquatics. Int J Aquatic Res Edu 2013;7.
. The critically ill child diagnosis and management. 3rd ed. Philadephia: WB Sauders Co, 1985:129–56.
. Epilepsy as a risk factor for submersion injury in children. Pediatrics 1993;91:612–6. Royal Life Saving Society - Australia. National Drowning Report 2013. Secondary National Drowning Report 2013, 2013. Australian Institute of Health Welfare. A Picture of Australia’s Children 2009. Canberra: AIHW, 2009. Australian Institute of Health and Welfare. Selected chronic diseases among Australia’s children. Bulletin Australian Institute of Health and Welfare 2005;29 http://www.aihw.gov.au/WorkArea/DownloadAsset.aspx?id=6442453396. Australian Bureau of Statistics. A snapshot, 2004-05. Health of Children in Australia, 2007. http://www.abs.gov.au/ausstats/abs@.nsf/mf/4829.0.55.001/#. (accessed 10 Feb 2014). Australian Institute of Health and Welfare. Part II: 4. morbidity. A picture of Australia’s children. Canberra: AIHW, 2005:17–27. National Coroners' Information System. History [NCIS]. Secondary history [NCIS]. 2014 http://www.ncis.org.au/data-collection/history/. Australian Institute of Health and Welfare. Children with disabilities in Australia. AIHW cat no DIS 38. Canberra: AIHW, 2004:17–27. Australian Institute of Health and Welfare. A picture of Australia’s children 2009. Cat no PHE 112. Canberra: AIHW, 2009:18–19.
. Learning to swim - What influences success? Int J Aquatic Res Edu 2015;9:220–40.
. Mobility device use in the United States: national Institute on Disability and Rehabilitation Research, US Department of Education, 2000. IBM SPSS Statistics for Windows, Version 22.0 [program]. Armonk, NY: IBM Corp, 2013. MEDCALC. Medcalc - Realtive risk calculator. secondary medcalc - Realtive risk calculator. 2017 https://www.medcalc.org/calc/relative_risk.php.
. Bystander basic life support: an important link in the chain of survival for children suffering a drowning or near-drowning episode. Med J Aust 2008;188:484–5.
. Where the evidence and expert Opinion Meet: a review of Open-Water Recreational Safety Messages. Int J Aquatic Res Edu 2011;5:251–70. Contributors RCF and JHP conceived the study. AEP sourced the data. JHP and RCF reviewed the medical details of each case. JHP and RCF formulated an interpretive judgement concerning whether the pre-existing medical condition was a direct cause, compromised a fatal drowning or was incidental. RCF conducted the analysis and wrote the manuscript. JHP assisted in the analysis and reviewed the manuscript. AEP reviewed the manuscript. Disclaimer The lead author, RCF, affirms that the manuscript is an honest, accurate and transparent account of the study being reported, that no important aspects of the study have been omitted and that any discrepancies from the study as planned (and if relevant, registered) have been explained. Patient consent Victims are deceased and data is stored by the data custodians, the Australian National Coronial Information System (NCIS). Access to researchers is governed under strict ethical protocols. Ethics approval Department of Justice Human Research Ethics Committee. Data sharing statement With respect to the data set underlying this research, these data are available on request. However, as the data have been accessed via a third party (coronial data), ethical approval and permission from the data custodians, the Australian National Coronial Information System (NCIS) is required before the authors are able to provide their data set to the person inquiring. There are strict ethical restrictions around the use of these data, and it can therefore not be sent to a public repository. Once ethical approval and permission from the NCIS as data custodians has been achieved, researchers can contact richard.franklin@jcu.edu.au to gain access to the data.